Classic antique gasoline pumps, the kind used at service stations when the largest sale stopped below $10, filled a few of the booths at the 49th Portland Swap Meet. The three-day show, which organizers call the largest auto parts gathering in the West, ended Sunday. The final price on the pumps' display was not only limited to three digits (including dollars and cents), but the price per gallon could only be two digits (plus that mysterious 9/10 of a cent). Amid the acres of rusty old auto parts at Portland Expo Center, a flash of bright paint catches the eye exactly the way it was designed to in the 1950s. 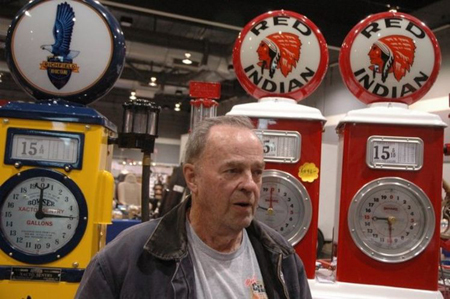 Mike Pankratz of Redmond, Oregon shows off some of the gas pumps he has restored. These pumps are Canadian, with a 5/10 instead of a 9/10 price per gallon. Thank you to The Oregonian and Photographer, Terry Richard for the use of their article and picture.